When I can't get to a card shop and have no other means to secure random cards to go through, I grab one of these $10 cubes - I figure I might have fun sifting through the junk wax cards to find at least a few cards for my mini-collections. 1992 Wild Card Barry Sanders #P7 - promo; it's a football card lurking in a baseball repack, but this might have actually been a 'hot card' when it first came out since collectors were crazy for promos back in the early 1990's. 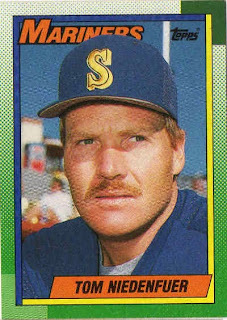 1994 Score Brian McCrae #19 - while the background is blurred out, it looks like Hall of Famer George Brett lurks on the on-deck circle. 1993 Score Charlie Hough #223 - as long as he is still kicking, having his cards are probably handy since he lives in So. 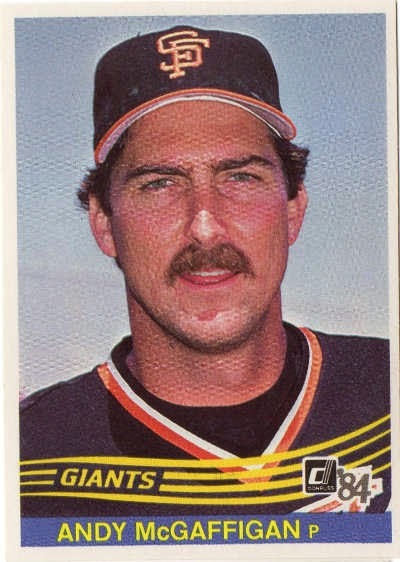 Cal and occasionally helps out with the Los Angeles Dodgers California League team. 1986 Topps Quaker Chewy Granola Bars Fernando Valenzuela #17 - I did a random search for his cards several days ago and it's a nice coincidence I get one of his cards that I'd probably put on my collecting topics wantlist, since I assume he is doing something 'hittery,' wearing a batting helmet. 2000 Upper Deck Dean Palmer #385 - it's not the greatest action shot, but I like how Palmer is captured giving the full effort in throwing the ball. Oakland A's fans are freaking out over the Donaldson trade because he had emerged as a star over the last couple of years - now fan favorite Donaldson goes to the Toronto Blue Jays in exchange for scratch offs and A's fans wonder if general manager Billy Beane has lost it. 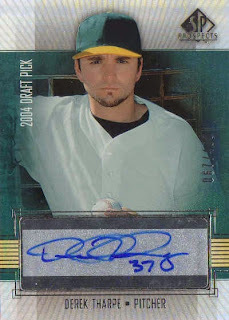 If I was an A's fan, I'd probably be sick to my stomach but Beane has to make moves - even if it meant sacrificing someone like Donaldson, who has a Twitter account that he uses to trade for his own baseball card and someone who really seems approachable for a big leaguer on a 'small market,' MLB team. In return, the A's get back Brett Lawrie, who has been up-and-down with injuries - Lawrie's talent is intriguing but can he stay healthy for 130-140 games? I think the A's let Lawrie stick at third base [where he has played most of his MLB career] - until top prospect Renato Nunez is ready to make the jump to the Major Leagues at some point late next season. Lefty starting pitcher Sean Nolin might be a decent for at least a few years - a guy that can be plugged into the rotation as a No. 4 starter and contribute immediately next year. I didn't know what a Kendall Graveman was before the trade and was surprised he reached the major leagues this past season - Graveman has put together some good numbers in the minors, but my best guess is that his upside is relatively limited [though might be useful if put into the right situations]. Minor league shortstop Franklin Barreto maybe the 'get' of the trade for the A's - though he might be at least a couple of years away, he's been able to hit a little bit and because of his youth, is bound to get better. 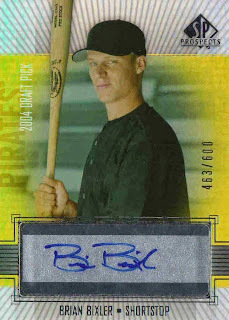 I picked up a couple of boxes for $29.95 each, hoping to pull a hidden gem [like a Dustin Pedroia autograph rookie or maybe a dual / triple autograph featuring a draft pick and an established MLB player and/or Hall of Famer] - however, I get what I pay for and these breaks turned out be dead junk wax breaks from the oughts. 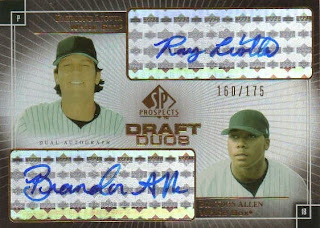 Dud autographs - I was hoping to get someone relatively decent but the deep autograph checklist obviously made it so the fillers are the most common pulls. 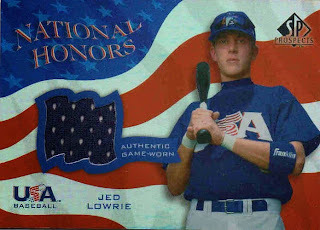 Each box contained two Team USA jersey cards, both featuring one-time Boston Red Sox players - Lowrie has been a decent MLB player when healthy and Bard was great out of the Red Sox bullpen until the Steve Blass disease derailed his promising career. For what it's worth, when it came to busting the 11-year old packs, there were condition issues with the rainbow foil board cards - the glossy cards were stuck to each other at times and when separated, bits of pieces of one card end up on the other. It's almost a good thing, it was mostly base cards of guys who didn't have much or any MLB impact - if I'd pulled better cards and they ended up messed up, then I'd be really kicking myself for wanting to bust these boxes. 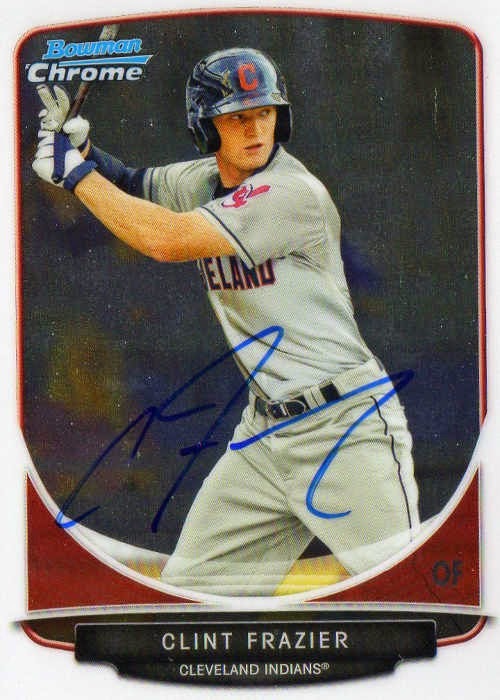 I sent this request out c/o Cleveland Indians [spring training] in March and got it back yesterday - it doesn't happen at all these days, but it's nice to get back a random SASE I nearly forgot about [though I remember this post] and actually get a pair of signed cards. This game-used [or was it event worn] swatch from some player's jersey card isn't guaranteed to be from anything - I just grabbed it online to have a picture up. I still like jersey cards but liking them isn't the same as valuing them considering what the swatches on the cards may or may not actually represent - from I read on the Blowout Cards forums, Panini's high-end football cards product [one that costs $1,349.95 for a pack of 10 cards] was exposed when suspicious looking swatches were inserted into memorabilia cards. Panini deemed the apparent mistake a mislabeling issue but it's a joke when a company can't even get things right in their top of the line football card product - cards featuring game used swatches have fallen out of favor because collectors just don't know if they are holding something that is all made up, but there is still an allure to getting a sweet patch card, along with an autograph. When there is big money involved, the fraud trickles down from the big time collector of actual memorabilia being duped to a card collector - animated with the cool things you can do with a trading card. 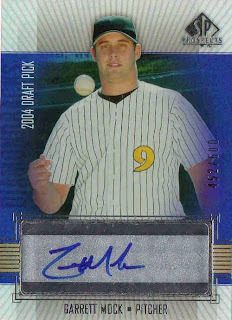 As is, a card company maybe oblivious when cards collectors want something that is too good to be true - a card company wants to sell product, maybe do a little 'razzle-dazzle' in the process, but maybe the logistics in trying to secure the real deal, means settling for something less than true, like reality TV. 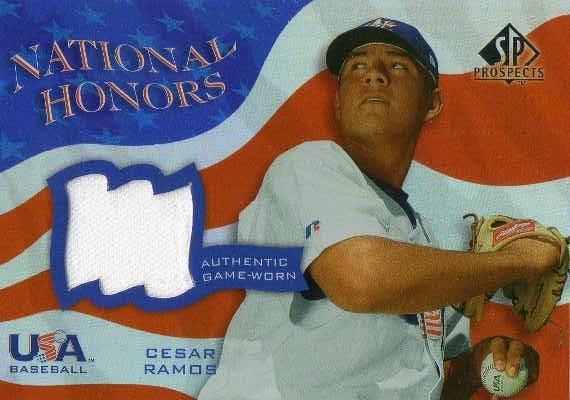 I used to laugh when bloggers would occasionally rant about the COA / fine print on memorabilia inserts cards - but with the Authentic Sports Investments / Bradley Wells game-used scam was exposed in 2012, the New York Giants memorabilia lawsuit and now this, it showed just hard it is to secure a game worn jersey / uniform from any number of professional athletes, chop them up and get assorted swatches on cards. 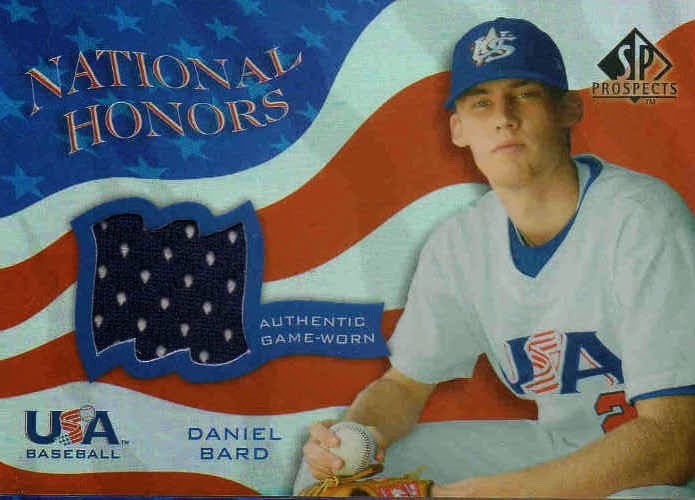 If game used memorabilia cards have to be created, make it where it's easy to get things right - get items direct from teams [with good provenance, not just a blanket 'it's good' seal of approval] from specific events / games / workouts. Even being right most of the time doesn't mean it isn't flawed or the process is clean - so more care should be taken to label things clearly so there is no confusion. 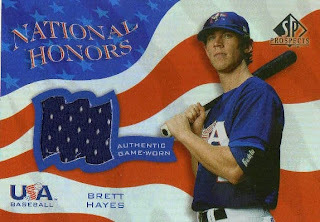 In the end, maybe the focus should be on manufactured memorabilia cards - so no one has to worry about where a particular swatch came from. I caught him in the Arizona Fall League and he works as a front office guy for the Chicago White Sox - I've hoarded his cards for a while and was geeked up to finally spot him at a game. 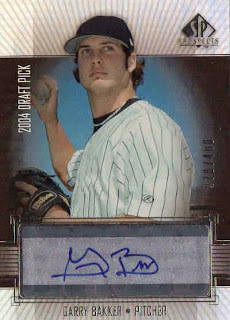 However, he only ended up signing one of my cards and not one [I had a couple] was a 2004 Upper Deck 25th Anniversary USA card for my set - maybe I should have jumped on him the moment I saw him, but I wanted to let my friend get him first in case it was just some random middle aged guy I only thought was Bell. I felt like Bell did me kind of dirty since I expected him to sign multiples - I probably had a few more chances to get him at the game I was at, but I was bummed out. 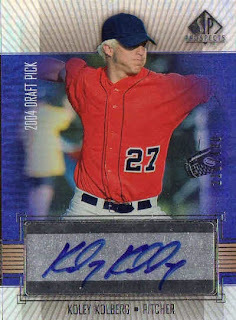 I sometimes get this Daniel Robertson confused with the other Daniel Robertson, the one the Angels recently picked up - the Robertson that signed this baseball is in the Oakland Athletics' system and might be worth watching as far as a guy should end up in the major leagues at some point. 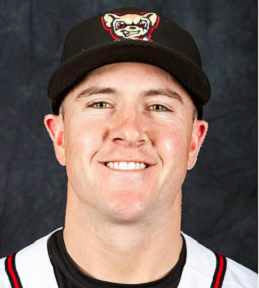 A scrappy little outfielder, Robertson just spent his first season in the major leagues with the Texas Rangers - the Angels just picked him up, though it remains to be seen if he is even in the organization between now and 2015 Opening Day. At best he maybe a back up outfielder type or a guy that can bide his time by playing every day in AAA - hoping for a MLB call-up in case an injury happens. 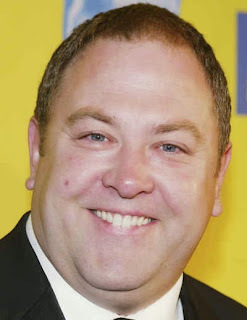 I got this autograph when he played with the Lake Elsinore Storm - for whatever, random reason, I've always thought his facial features remind me of actor Mark Addy. 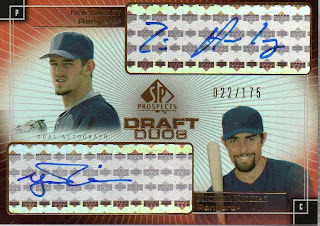 I picked up this printing plate for just about $10 the day I found out Perez was one of the players the Angels got back in the Hank Conger trade - I saw another collector getting a printing plate signed in the Arizona Fall League and I wanted one for myself. It's kind of an ugly card anyway, but the worst part is when the card arrived in the mail - the top right corner was bent out of shape like someone grabbed it and twisted it just a bit. I don't know if it was damaged before it was shipped or if it was damaged during shipping - I suspected that it was because no decoys / dummy cards were used to sandwich the card and the bubble mailer used to ship the card to me was a little thin. If it was a regular card, the damage would be more pronounced and too obvious to ignore, but the card is imperfect as is - to make the upper right part of the card a little bit more straight, I tried to flatten the card with a dumbbell. I did contact the seller for an explanation and was offered a partial refund [minus s/h] - even though I was the one left with a damaged card, I just let things be because I'm looking to get the card signed and put it away. The 19-year old Raul Adalberto Mondesi is the more prominent of the two sons of the original Raul Mondesi to play professional baseball - the other son [Raul Ramon Mondesi Jr.] might have already flamed out and his playing status is unclear at this point. A Kansas City prospect, Raul A. Mondesi hit only .211 in the minors this past season [with 24 walks and a 122 strike outs] - but with youth and potential on his side, he was still tagged by Baseball America as the Royals' number one prospect for 2015. I was looking to bring home a fall league souvenir besides the assorted things I may get signed and I was able to get this game ball - I was hanging down the right field line during a day game in Mesa and after a foul ball was hit [probably down the line, where it ricochets back onto the field], one of the outfielders has to grab it to toss it out of play. I call for the player [Dwight Smith Jr. of the Mesa Solar Sox] for the ball and he throws it towards my direction - there was no one around me and I ended up with the ball; it's not quite a big deal because I'd like to think I'm all grown up, but I didn't have to worry about impulsively buying a program, a media guide or maybe a t-shirt. A relative unknown coming into the 2014 season, the native Canadian is going to be the next big thing in the outfield [at least for the Toronto Blue Jays] - Melky Cabrera doesn't look to be re-signed, Colby Rasmus' status is up in the air and Anthony Gose [who might have been in Pompey's shoes just a few years ago] was shipped off to Detroit. Pompey has made a steady, unspectacular climb through the minors, but while he might not be a finished product, he is going to be 22 next year - he has speed to burn and if his other hitting attributes come together, he might be a top of the lineup threat for years to come. Winker led the Arizona Fall League in hitting and was ranked No. 6 among the Top 25 AFL prospects according to Jim Callis at MLB.com - Winker's emergence may make Jay Bruce trade bait if the Cincinnati Reds are offered the right players in return. Greg Bird was named the 2014 Arizona Fall League Most Valuable Player - I got him to sign a few times and his limits would generally vary from signing one to three cards at a time. 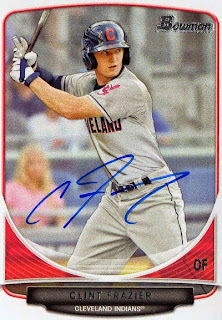 Tyler Austin is a great autograph signer - though he was a repeat from last year's fall league, he continued to be accommodating when he signed, patiently signing cards for those who approached him without any hesitation [within reason of course, but if you had the cards, Austin would sign pretty much all of them]. 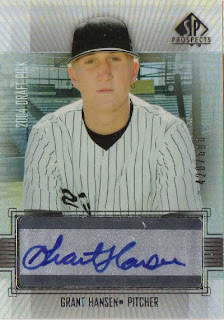 This was a card given to me by my buddy when I didn't have anything for Judge to get signed after a game in Scottsdale during the Arizona Fall League - my quick impression of Judge is he's a gentle giant, maybe just a humble sort who is fairly down to earth [for a prospect]. However, there is no mistaking the fact that Judge is one large human being and sort of similar in stature the Miami Marlins' $325 million man Giancarlo Stanton - as is, looking the part is one thing, but Judge isn't quite projected to be the slugger Stanton has been. If things fall into place, Judge maybe more of a very good MLB player [or even trade bait if it comes to that point for him as a New York Yankees' prospect] - rather than a player who can be a franchise player the Yankees can build around for years to come. In the Arizona Fall League this past fall, I got the sense a lot more players were 'one per' and/or basically didn't want to stop and sign all the time - Reynolds was one of those players who picked his spots and I only got him to sign [on a couple of cards in two separate times] in my last AFL trip. 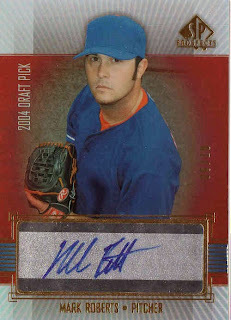 I like how his autograph 'pops' on the Team USA memorabilia card - the soon to be 24-year old New York Mets minor leaguer had a breakout season this past year and maybe ready to contribute at the MLB level in 2015. Ausmus was an 'extra guy' I got during a game at Camelback Ranch in my last Arizona Fall League trip - I actually picked up the 2006 Topps Turkey Red from the card shop near the ballpark [during my first trip to the AFL], but didn't get the card signed until my second AFL trip. 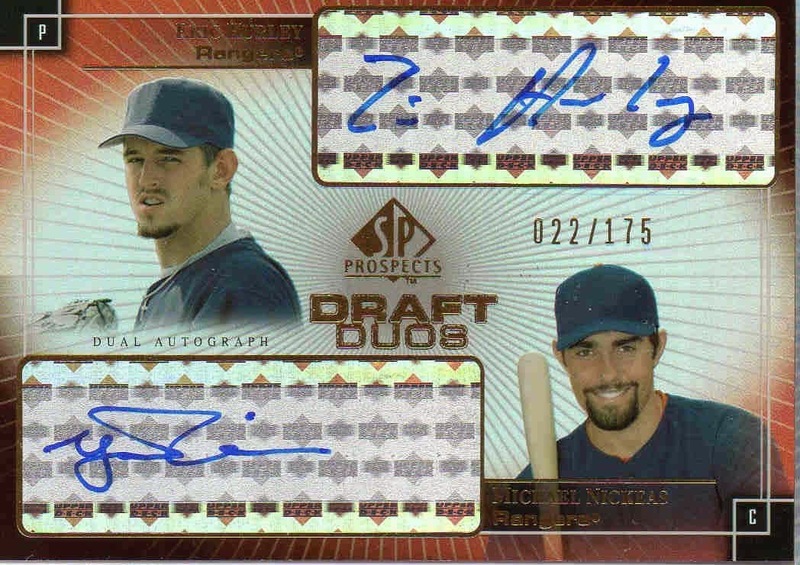 Neither guy had any actual cards out yet, so I got them on the same dual blank card from the The Autograph Card - both Cincinnati Reds pitching prospects, Iglesias was a Cuban free agent signed to a MLB contract this past summer and Howard was the 19th overall pick in the 2014 First Player Draft. 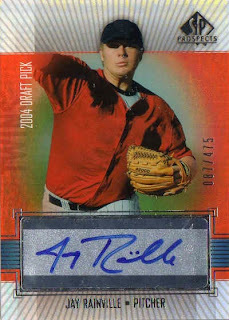 I was able to make a couple of trips to the Arizona Fall League this year and after getting my cards signed by the Chicago Cubs pitching prospect my first trip - I ended up printed up two images for him in my last go-around to the AFL. I think he was down to 'one per,' but was able to get my prints signed on successive nights [not without a glare from Edwards the second time] - I mumbled that the second was the last print I had for him in case he did remember getting me the night before.